There are many great ways to stage your home that will immediately interest viewers, but some have the power to engage the senses and impress potential buyers all the more. Whether you’ve already put your home on the market or are looking for insider tips when you do, here are some ways to sway the eyes, ears and noses of the buyers you’re looking for. There is probably a certain kind of buyer you’ll have in mind when deciding to stage your home, so it’s important to keep in mind how your house might appear to them. While differing textures and fabrics can certainly add depth and character to a home, you’ll want to ensure that they are also flattering to each other and compliment the style already apparent in your design aesthetic. Few things are more likely to assault the eye of a potential buyer than a house that is full of trinkets and general clutter. Instead of leaving it up to the viewer to unearth what’s great about your property, be sure to do a cleanup beforehand and walk into your house as if you’re seeing it for the first time. If your eye gets caught on a pile of magazines or the gadgets left in the front entrance, it may be a good idea to clear some of it away. Most buyers will be drawn into a home if they can imagine themselves in it, and few things will have a more positive effect than the way that it smells. Instead of using an air freshener, go for the naturally baked scent of a batch of cookies or muffins to provide the sense of something homemade. If your potential buyers are bakers, they will instantly be able to imagine themselves in your home; if not, they’ll be tempted by it either way. It certainly helps the market value of your home to have an organized exterior and an up-to-date kitchen, but drawing a potential buyer’s senses into the mix can have a particularly positive impact on their interest level. It may even lead to a sale at the price you were looking for! 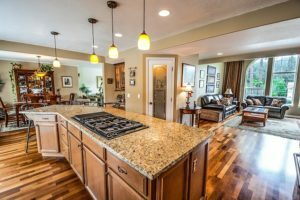 If you’re currently perusing the real estate market for home options in your area, you may want to contact one of our professional agents at First Thomasville Realty who can help you with staging or any other needs for getting your home sold!